BELIZE CITY, Thurs. Mar. 31, 2016–Each year, the Cycling Federation of Belize (CFB) will award this prize to a deserving person. Mr. Garbutt was the recipient of this year’s award, which was held at the closing ceremonies at BTL Park. We congratulate Mr. Garbutt, and are looking forward for the next deserving awardee. 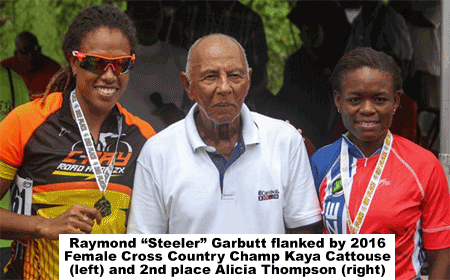 The word philanthropy is synonymous with the name Raymond ”Steeler” Garbutt. Our award today is fitting to a guy who has literally been giving and giving and giving. In fact, that giving didn’t just happen out of the clear blue sky. It all began with his late father, who started the tradition of donating $100.00 as station prize at the Garbutt Service Station in Roaring Creek. Since then, that figure has grown considerably. Mr. Garbutt not only donated to the Holy Saturday Cross Country, but every single race that passes through, or finishes at the Gas Station, rest assured, there will be a prize. Speaking with Mr. Garbutt, he reiterated that cycling is a hard sport, and the cyclists deserve to be compensated, hence his generosity towards this sport. The CFB is honored to present the 2016 Philanthropy Award to Mr. Raymond “Steeler” Garbutt for his continued contribution to the sport of cycling. We thank you for your notable, selfless act of kindness towards the development of cycling.